JIM: Brothers and Sisters, I want to welcome you our holy temple in Washington DC, a place where the future of the developing will be determined by a bunch of rich guys in suits. It is here in this church that we preach the word of the Bank. And that word is: if the rich get richer, the poor will flourish. It doesn't have to make sense, you just have to BELIEVE! And believe is what we do. Ladies and Gentlemen, Brothers and Sisters, Bankers and developers, converted and those who soon shall be, and of course the meek and huddled masses. Are you ready for some power? Are you ready to fill the world with hydroelectric dams and heavenly power plants? As always, we have US$24 billion to lend before the night is out. That's right US$24 billion. You can well imagine the cost of lending so much money! Manning the phones, as always, is Brother Treasury Bond. How are we doing, keeper of the holy phones? BOND: We're getting calls from all over, Jimmy Sheep. India just accepted a plan for 20 coal fire power plants for US$1.2 billion. That brings their foreign debt up to over US$71 billion. I've got Russia and Sub-Saharan Africa on hold and they all want to borrow, Borrow, BORROW! JIM: That's it, Brother Bond, reach out and touch those economies. Now before we begin teaching the word, I see some new faces out there and want to be sure you all know how the High Church began. Gather round and listen to the word of the Bank, our Father in Washington DC. It was 1944, a dark, dark year when Europe lay in ruins, the Bank rose from the ashes with the express purpose to rebuild Europe through huge construction projects. But alas, other funding agencies beat the Bank to the punch and they were left without purpose. The Bank was adrift for years in a sea of hopelessness. But the Bank found the Light. It decided to use the same system it had intended to reconstruct Europe with and apply it to undeveloped countries. This glorious 1950's style of development, filled with delightful dams and heavenly highways, would be used in every town, every city, every country. But the word of the Bank didn't stop there. The Bank was also able to restructure a country's entire economy so it could repay the tremendous debt it owed. Of course this structural adjustment had some drawbacks but the word of the Bank was spread. And spread it has, to every corner of the world. Now those of you hearing the word for the first time may be feeling doubt. You may be questioning the word of the Bank. There were times when we all doubted. Why, even I have faltered. Yes, yes. In my dark days of doubt, I questioned the holy word of the bank. I questioned development. Can hundreds of different countries with diverse cultures and values be forced to develop the American Way? Can the future of these countries be determined by a couple hundred bankers living in Washington, DC? "Where are the answers?" I shouted. "Where?" Just when things seemed their darkest, I found the truth. I found it right here in the book of Operational Directives. Using this book we can build anything from a coal-fired power plant to a market-based economy, all from the privacy of the Bank's offices in DC. With this book I saw the light. I need to know if you all out there see the light. I need to know if you are ready to jump and bump, to dance and prance, to sing and swing to the word of the bank. Do you see the light of giant construction projects? DEVOTEES: Praise The Bank! We see the light! JIM: Do you see the light of 1950's style development? 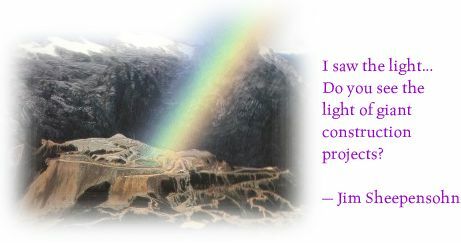 JIM: Do you see the light of forced settlement of the poor? JIM: Mercy, the Bank is with us tonight. Let us all pray together. Turn to page three of your hymnal. Let us kneel and pray. globally integrated, forever and ever. JIM: Now let us all come together and song and sing the Bank's praises in the rousing hymn, A mighty fortress is Our Bank. Please turn to page four of your hymnal. "A Mighty Fortress is Our Bank." This file can be played in any Quicktime or MP3 player. the endless Whirled Bank bailing. And watch the prices drop. So we will remain pure. Our future is in retailing. And we will always be in debt. Thank you. Now we have a special treat for everyone tonight. The sermon will be delivered by none other than the former high priest of the Bank, Brother Robert Strange McNamara. Father NcNamara has been elderman of the Holy Ford Motor Company Church,and Secretary of Defense during which time he lead our glorious effort in Vietnam. After these accomplishment, he became director of the Bank for 13 illustrious years. Under his policies, the Bank was able to become what it is today, a bloated, isolated bureaucracy obsessed with getting as any loans out the door as possible. Please welcome Brother Robert. MCNAMARA: Thank you, Jimmy Sheep, and Bank bless you. It is wonderful to be here before the flock. I will make my remarks brief. In 1973, I pledged our Bank to end poverty, a condition of life so degraded by disease, illiteracy, malnutrition and squalor as to deny its victims basic human necessities...a condition of life so degrading as to insult human dignity. The Bank feels bad for the poor people. And that is why it wants to lend them money. 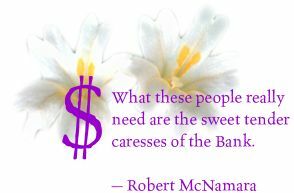 What these people really need are the sweet tender caresses of the Bank. MCNAMARA: Casting its shadow over the world is the mushrooming cloud of the population explosion, blowing apart the rich and the poor and widening the already dangerous gap between them. Numbers are a language for me. Uno dos tres, taco taco taco! Ha ha! ha!..ahem. Not all problems can be solved through analysis, but few problems are not made clearer by a careful look at statistics. We could of course do better at this. Perhaps we should pay more attention to the development of superior systems of analysis. Management is the gate through which social, political, economic and technical change is rationally spread through society. In my view, the fundamental case for development assistance is a moral one. Removal of the causes of human suffering and deprivation is essential if stable political institutions are to flourish free of the threat of violent revolution. We have to send support to those traditionally listless areas of the world which have become seething cauldrons of change. DEVOTEES: Those Wacky Listless! Watch Them Seethe! MCNAMARA: It is the bank's policy to be open about its activities and to seek out opportunities to explain its work to the widest possible audience. Hunger is caused by people having neither the capacity to produce food nor the income to buy it. Fundamentally, hunger is caused by poverty. The rich and powerful have a moral obligation to assist the poor and weak. JIM: I've seen a hundred signs, a magnificent sunrise, and a green light when I thought it had turned red, but never have I seen anything like this! Well...even with all the wonders that have been laid out tonight, I still feel doubt. I say I hear doubt knocking, but I ain't going to let him in. I say to you doubter, are you ready for the word? Are you ready for the truth? What is your story, my son? BANKER: Well, I, uh, I work for a small development bank that makes small loans and works closely with local communities. What you're talking about doesn't make sense. You can't help these folks by sitting in Washington, then flying out once a year to stay in that country's Hilton. Please forgive my doubt. JIM: That's sin talking, my son. Yackety Yak! Money's talking back. Don't you see, The more we give, the more they live! These words are truer than Lincoln and louder than thunder. This has been the way for 50 glorious years and we ain't about to change. Centralization is the way. Now don't show any dismay. Now I want you to feel the Bank. BANKER: I feel the Bank. JIM: I said feel the Bank! BANKER: I feel the Bank! JIM: You were working for sin. Now you're working for the Bank! BANKER: Oh thank you, Brother Jim. Now I feel worthy. Worthy enough to build. To build a road through the rainforest. I will build this road through forest and village, through human and animal. Nothing will stand in its way. And on this road will be strip miners and forest companies. This road will be a golden path of development cutting into the heart of the rainforest. This road will make the Amazon what into exactly what the Bank wants: a barren wasteland covered by sand. And by God, no indigenous tribe or environmental group will stand in my way. Praise be the Bank! JIM: I ain't done yet folks. I'm getting that feeling. I'm getting that feeling like it's time for a healing. I feel the fever on me. Where you from, my son? JIM: India has been part of the Bank's congregation for many years. Over 20 million unsuccessfully resettled and we ain't done yet. So what's on your mind? INDIA: Well, I used to have a piece of farmland in the Narmada Valley, and now its covered with water, and I have been moved. We protested and I was injured. I am losing faith in the Bank. JIM: Wow, dusty farmland to waterfront property huh? You lucky devil. Get this man a fishing rod. No, just kidding. I take this very seriously. You know there are times when it must seem like the Bank doesn't care. These are the times that try our faith. Well, the truth is, my friend, the bank works in mysterious ways. Sometimes it may seem that the bank is wrong, but it is not. The way of development is hard and arduous, but once you are on it, there is no turning back. 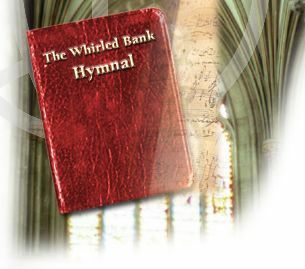 Now I want you to close you eyes and listen to me: The bank will heal you, the bank is your light and your salvation. HEAL! HEAL! HEAL! WALK TO ME NOW, DROP THOSE CRUTCHES AND WALK! INDIA: (throwing crutches). I believe, I believe! I CAN WALK! I CAN WALK! PRAISE THE BANK!! JIM: It's a miracle! Can I get a glory from the CHOIR? JIM: Can I get a glory from the organist? JIM: The healing has made me tired. Should I stop now? JIM: I say, should I stop now? DEVOTEES: No, preacher! JIM: I've got to talk to these people some more. The Bank will be my strength. Is there anyone out there who wants to hear the word? I feel a lending coming on! The Bank is on the mainline, tell it what you want! JIM: Hi there, little brown-skinned lady. What's your name? JIM: Ah, yes. If I recall correctly, under our direction, you removed price controls from food, plunging your country into chaos and wrecking democracy there. What commitment! VENEZUELA: You knew!?! You saw?!! JIM: Ah yes, when a little bird falls from the sky, or when a country tries to nationalize an industry, the Bank knows. VENEZUELA: Gosh. Well I was wondering. We shared in the bank's generosity, borrowing money for years, and now we owe more money back than we have to give. We were trying to get out of poverty, but, Dios mio, borrowing all this money that we have to pay back is destroying our country! Comprende? JIM: My dear Senorita, to the Israelites, the Bank parted the sea, to Moses the Bank spoke through the burning bush, and tonight the Bank has chosen you! My dear little lady, the Bank can take you from lowliness to holiness. Step forward and ride that golden elevator to the the Bank's own penthouse in t he sky! Here's a 100 million dollar structural adjustment loan: the Bank has chosen You! JIM: Miracles and Wonders! It's Sharon Pratt Kelly, mayor of the District of Columbia, the Capital of this great land, the United States of America! What can the Bank do for Herronor? SHARON: Now wait just a second, you Holy Shamola! You lend the bucks to those outside the beltway, but my effectiveness as a leader of leaders depends on the financial viability of the District. We got Marion Barry trying to make a comeback, placating the gangs with his Dashikis and street savvy. I can't compete with his criminal record. I want Money, what I want! So C'mon, cough up at least enough for the Barney Circle freeway! Talk to me, Mr. Deeppockets! JIM: I feel a lending coming on! Oh, great forces of Solvency, I'm just a man like any other, but help my sister Sharon Pratt.. Help me reach deep into my account and find an answer placed there by the Bank! (Reaches into his pocket and pulls out a huge wad of bills, presents them to her while touching her bro w) Well, looky here! Another 100 million dollars! The Bank will set your freeway free! Normally the Bank concentrates on Third World countries, but hey, this is DC we're talking about. Plus, In the immortal words of Rodney King, Can't we all get a loan? 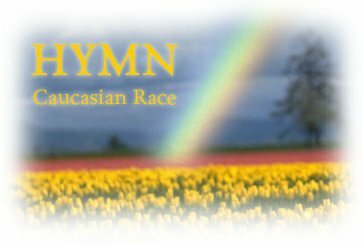 "Caucasian Race." This file can be played in any Quicktime or MP3 player. Away the crops I grew.